The HMS Queen Elizabeth, Britain's largest warship, anchors near the Lower New York Bay, Saturday, Oct. 20, 2018, in New York. 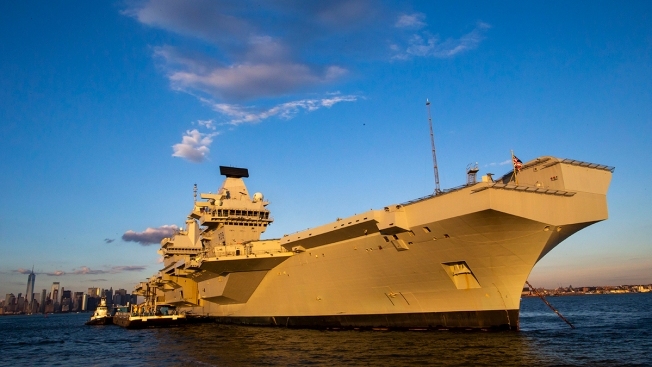 The largest ship ever built for Great Britain's Royal Navy is visiting New York for a week. The aircraft carrier HMS Queen Elizabeth sailed into New York Harbor on Friday carrying about 1,500 sailors. Commanding officer Capt. Jerry Kyd called the visit "very symbolic of the intimate relationship the Royal Navy has with the U.S. Navy and Marine Corps." The ship is anchored in view of the Statue of Liberty and can be seen by Staten Island Ferry commuters. The 932-foot warship carries up to 60 aircraft. British Defense Minister Gavin Williamson welcomed the Queen Elizabeth to New York. He called the ship "a symbol of our commitment to our #security and the security of our allies" on Twitter.